Our approach to food service is customer-oriented, youth and family-friendly, and accommodating for most special dietary needs. Meals can be served on a buffet line or family-style, depending on your group’s needs. Meals are balanced, with fruits and vegetables readily available in addition to the main course. 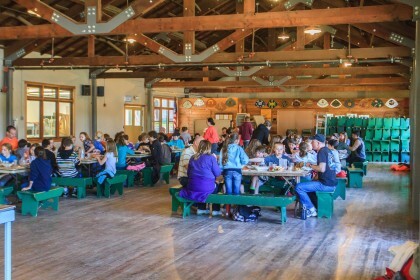 Our adult group guests enjoy choices such as fish tacos, chicken parmesan, soup or salad bar, while a more‘’kid-friendly’ menu, as used by our summer camps and environmental education groups, includes options such as spaghetti with meatballs, pizza, or build your own burritos . A full service coffee, tea and hot chocolate bar, fun afternoon snacks and evening treats such as s’mores can help to round out your day! Most common food allergies and dietary restrictions can be accommodated, including dairy-free, wheat free, vegetarian, and vegan diets. Prior to camper or participant arrival, your special diet information will be requested and given to our Food Service Manager. While most special diets can be accommodated, individuals with extreme allergies or a Kosher diet may need to bring food to supplement. Camp Sealth is 100% peanut-free – we do not serve or allow any peanut products in camp and check all the food served to ensure it was made in a peanut-free facility. We cannot guarantee that all food is free of all nuts, however, we can provide nut-free alternatives to campers with allergies. 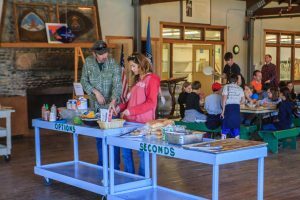 We are happy to answer any specific questions you may have about Food Service at Camp Sealth. Find more information about meals during our Summer Overnight Camp or contact us directly.